2 Simple and Purple Mash Help - How do I update Purple Mash users from my MIS? All Categories ​>​ Purple Mash ​>​ Setting up Purple Mash ​>​ MIS Integration ​>​ How do I update Purple Mash users from my MIS? Whether you are a new customer looking to create accounts for the first time, or an existing user looking to create accounts for your new intake and rollover the current pupils into their new classes. Then the easiest way to do this is via the MIS sync wizard. We have partnered with Groupcall- Integration and GDPR experts whose Xporter-on-Demand (XoD) tool allows us to update Purple Mash in just a few clicks. Not only is this the quickest way of creating Purple Mash user accounts, it negates the need for CSV files and therefore safer if GDPR is a concern for you. This only needs to be done once but we cannot run the MIS sync wizard without first setting up XoD and authorising the relevant data to be shared with Purple Mash. Log into Purple Mash and head to 2Lasso (create and manage users) from the admin area. Once in 2Lasso, you will see a "tools" option at the top. If you select tools and then select "MIS sync wizard" you will see this pop-out. Where you will be asked to choose which data areas from the MIS you wish for Purple Mash to see. Read this information carefully and you can also see more details about what data Purple Mash requires here: What MIS data does Purple Mash require? 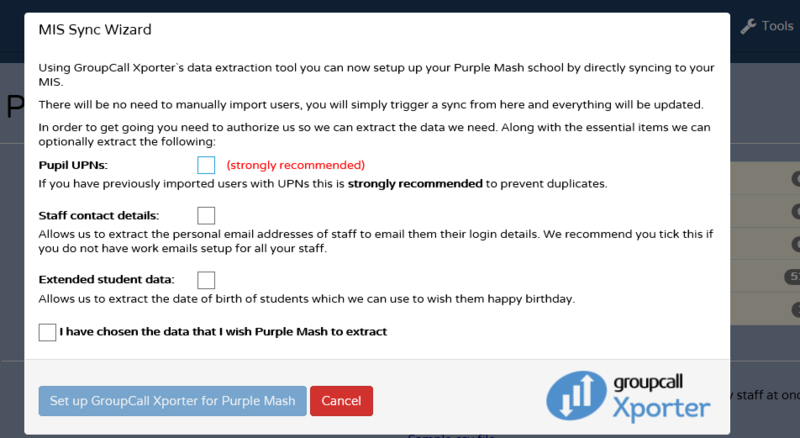 Confirm you have chosen the data you wish Purple Mash to extract and click "Set up Groupcall Xporter for Purple Mash". This will generate an email to you from Groupcall ask you to consent the data share. Follow the instructions on this email carefully and be sure to enter the details of the person with authority to share data if this is not you. You can find a useful video to talk you through this here: How do I authorize the data share between Purple Mash and my MIS? If this is the first time setting up Groupcall Xod, at the end of the authorisiation process you will be asked to book a time to install the software. Please follow the instructions to book a time with Groupcall to do this. If you are already using Groupcall XoD with another app in your school you will be able to go straight back to Purple Mash and complete the MIS sync wizard. Once authorised and installed, you're now ready for the MIS sync wizard and won't have to repeat any of the above steps again! 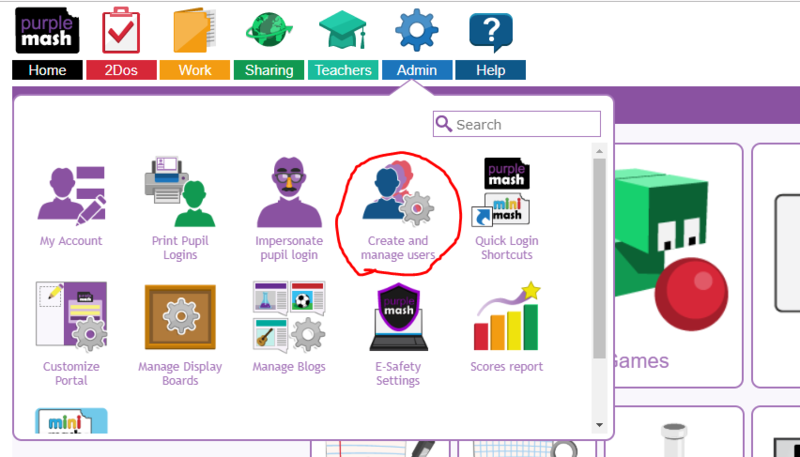 Again, you will need to log into Purple Mash and head to 2Lasso (create and manage users) from the admin area and select "MIS sync wizard" from the tools section. This time you will see step 1 of the wizard, asking you to choose the user name format of your pupils and staff. We recommend setting up pupils in the format "forename + surname initial (e.g. John Smith would have the username JohnS) as children tend to learn their first name before their last name, but you can choose whatever you wish. For staff, we would recommend "sync only teachers" as generally speaking all staff do not require an account (and its easier to manually add the odd staff member who does later, than it is to remove all the staff who do not need an account). We recommend setting staff usernames to the format "forename initial + surname" (e.g. John Smith would have the username JSmith). Click next to move onto step 2 which is selecting the password formats. You can select by year group as a text-typed password may not suitable for your EYFS pupils but perfectly suitable for your KS2 children. Again, click next to move onto the next step- mapping year groups. This step only needs doing once, but is very important. Depending on what MIS you use, you may have a different naming format for each year group. For example, "Year 6" could be known in your MIS as "Y6", "Year Six", "6", "Yr6" etc but Purple Mash will only recognize "Year 6". Therefore simply map your year groups to the Purple Mash format. 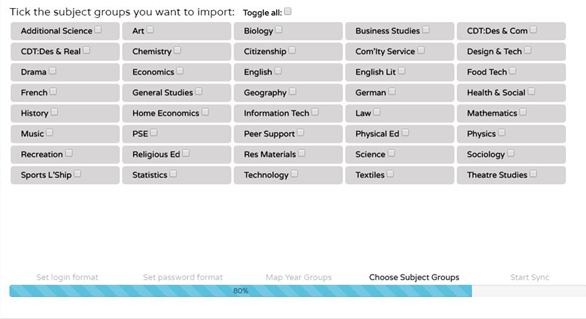 The final step is optional, simply click next again if not applicable to your school but you do have the option to import subject groups. Once you have hit next you will be shown a summary of the information you are importing. Check this is what you were expecting to see and hit "finish" to create the user accounts. Any new staff accounts will be sent an activation email and you will be able to print out login cards for the pupils. If you have some "users who will not be imported due to errors" then this is most likely staff members who do not have an email address in the MIS. Don't worry, you can still complete the sync and either manually add any missing staff afterwards, or add the emails to the MIS and run the wizard again.